Tours by Frieda | Kipelach, mmm! I always ask my groups what the above pastries are, and invariably a few people will call out rugelach. I ask if they know of another name for it, and not once has anyone ever said kipelach. However, I never heard of the Yiddish word “rugel”. For regal, we used a Hebrew adaption of malchusdig or maybe the Yiddish keniglech or prechtig. “Austrian bakers originally called the little pointed loaves of white bread zipfel (German meaning “corner/tip”), also spelled ciphel. Zipfel is still used, in conjunction with polster (cushion/padding); polsterzipfel refers to a jam-filled Austrian cookie, also known as Vienna kipfel and in Germany as hasenörchen (little rabbit ears). Meanwhile, the Viennese took to mispronouncing the pointed breads as kipfel, and the word soon becoming a synonym for the German hörnchen (crescent). It seems the original kipfele had a pronounced F that is no longer around in the Hasidic pronunciation, which is kipele. 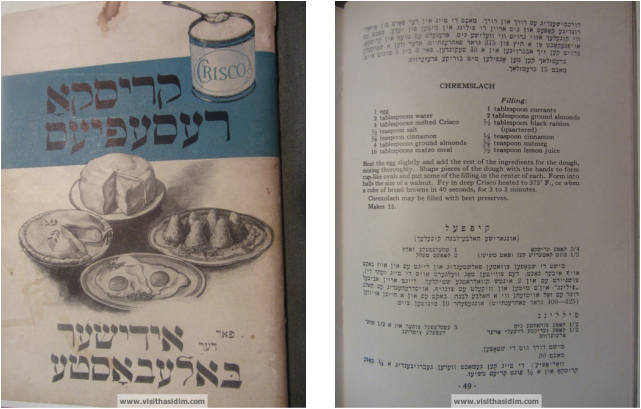 In the 1933 Crisco Recipes for the Jewish Housewife, there’s a kipfel recipe. It calls for a lot of cottage cheese in the dough, something I imagine no one who makes Hasidic kipelach does. The pastry is described as “Hungarian half moon cookies.” Here’s the recipe. The word “filling” is transliterated in Yiddish, already beginning the tradition of adopting English words to Yiddish. If anyone makes it, please email me the pictures of the kipfels and let me know how it tastes!